Living in Boston in 1959, Sylvia Plath had much success publishing her work in The Christian Science Monitor. Why, that year alone she had 17 works published. (To see a list of her publications, visit the publications page on A celebration, this is). Four of these publications were journalism pieces (two of which included her own hand-drawn sketches). These pieces were on subject such as Top Withens (aka Wuthering Heights) in Yorkshire, mosaics, and explorations and discoveries. On May 5, a "Kitchen With Fig Tree," which recalls that Widow Mangada and her time in Spain was printed. Did you know that "Kitchen With Fig Tree" was reprinted in Canada's Buckingham Post and Papineau County Echo? It was! On May 29, 1959 (hey, that's today. Coincidence? ), this Quebecian newspaper printed a slightly shorter version and appeared under the title "A Kitchen with a Fig Tree." Canadian's must like articles! If you buy books online, I recommend ABE books. It's a simple, easy to use website and the sellers are generally accurate, fair, etc. There are many sorting options, too, which can really assist in finding just the right book. ABE has just published via their blog, Reading Copy, what they consider to be the top 50 iconic book covers. Faber's first edition of Sylvia Plath's The Bell Jar (1966) made the list! Stare at this cover long enough and its concentric circles will make you dizzy. With June just around the corner this novel tends to be on my mind more so than usual. There are at least two textual variations in Sylvia Plath's novel The Bell Jar that were introduced in 1996 when Harper's published their 25th anniversary edition. In Chapter One, the paragraph "I knew something was wrong with me that summer, because all I could think about was the Rosenberg's...outside the slick marble and plate-glass fronts along Madison Avenue"and the sentence "I felt very still and very empty, the way the eye of a tornado must feel, moving dully along in the middle of the surrounding hullabaloo" are both wrapped in parentheses. While I have not taken a more in-depth look at the text before and after this in the novel, I find this quite bizarre. The Faber editions that I have consulted do not have the above passages parenthetically trapped. In reading the novel at least once a year and switching between Faber and Harper versions, sometimes I have felt as though some of the text was new or different. Look for Heather Clark's The Grief of Influence: Sylvia Plath and Ted Hughes expected to be published this fall by Oxford University Press. Throughout their marriage, Sylvia Plath and Ted Hughes engaged in a complex and continually evolving poetic dialogue about writing, love, and grief. Although scholars have commented extensively on the biographical details of Plath's and Hughes's marriage, few have undertaken a systematic intertextual analysis of the poets' work. 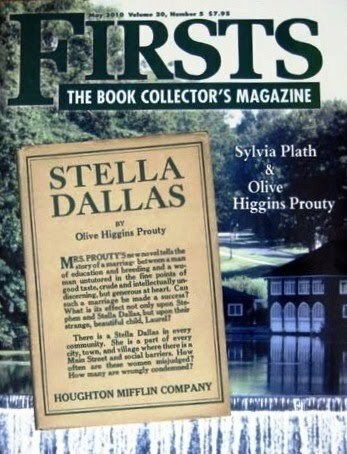 The Grief of Influence reappraises this extraordinary literary partnership, and shows that the aesthetic and ideological similarities that provided a foundation for Plath's and Hughes's creative marriage - such as their mutual fascination with D. H. Lawrence and motifs of violence and war - intensified their artistic rivalry. Through close readings of both poets' work and analysis of new archival sources, Clark reveals for the first time how extensively Plath borrowed from Hughes and Hughes borrowed from Plath. She also explores the transatlantic dynamics of Plath's and Hughes's 'colonial' marriage within the context of the 1950s Anglo-American poetry scene and demonstrates how each poet's misreadings of the other contributed to the damaging stereotypes that now dominate the Plath-Hughes mythology. Following Plath and Hughes through alternating periods of collaboration and competition, The Grief of Influence shows how each poet forged a voice both through and against the other's, and offers a new assessment of the twentieth century's most important poetic partnership. "Tracking the Thought-Fox: Sylvia Plath's Revision of Ted Hughes." Journal of Modern Literature 28:2. Winter 2005: 100-112. "'Wilful Revisionism': Rivalry and Remaking in the Early Work of Sylvia Plath and Ted Hughes." Symbiosis: A Journal of Anglo-American Literary Relations 9:2. October 2005: 174-191. 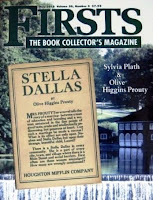 The May 2010 issue of Firsts: The Book Collector's Magazine, features a cover story on Sylvia Plath and Olive Higgins Prouty. The blurb on the website, complete with a disgusting factual inaccuracy, compellingly suggests, "Perhaps it is time to look at her work from a more objective point of view" Couldn't agree more, but you should start by getting the facts right! I have a copy on the way to me, but thought I would pass along the heads up in case your local bookshop is a carrier. Harold Bloom is at it again (would he do it one year in every ten!). This time he has reprinted Wendy Martin's 1973 essay "'God's Lioness': Sylvia Plath, Her Poetry and Prose" in The Taboo, part of Bloom's Literary Themes (pages 157-164). I do not think Plath will feature in the forthcoming Bloom's Literary Themes book on Doughnuts. Anyway, not too frequently do relatively affordable Victoria Lucas (aka Sylvia Plath) editions appear. There were two editions to appear under the name Victoria Lucas: the Heinemann 1963 edition and their sub-edition, printed under the Contemporary Fiction imprint, the following year. Browsing ABE books, there are presently twenty-something copies available of these editions. The cheapest is about $380. The most expensive? $12,500. The cheaper copies tend to be the Contemporary Fiction sub-edition, the more expensive, as one would expect, the true first. The presence of a dust jacket increases the value substantially: and if the original jacket is a fine condition you'll have to take out a loan. There are two Contemporary Fiction editions on auction right now through eBay UK. Neither copy has the real, issued dust jacket (though one of them confusingly and contradictorily seems to include a facsimile dust jacket of the first edition. What this seller is trying to do is beyond me). Anyway, click here (ends 16 May) | or here (ends 22 May) to bid. Univeristy of Chicago Press, who is the US distributor for the British Library's Spoken Word: Sylvia Plath, sent me an email this morning announcing that the CD was available now. I'm a little confused by this as earlier in the week I was told it would be available on 15 June. However, the website does indicate it it "available now." Remember, you can receive a 10% discount on what Lorna Bradbury of The Telegraph calls "an exquisite recording" by clicking here. Shipping is $5. This is the first Sylvia Plath Info video post. In April, I visited the Mortimer Rare Book Room and took this (poor quality) video of Plath's library. There are two parts. Stay tuned for more video posts in the future, I think. On YouTube, which I'm new too, my user name is sylviaplathinfo. Thanks to Susan in Australia for this link to an audio interview (with transcript) of Helen Vendler discussing her recently published Last Looks, Last Books. Ariel by Faber is now available. Recently published online are two articles by Jessica Ferri, a Brooklyn based writer. See "In Which We Flay Ourselves Into Poets" on thisrecording.com and Writing Food, Writing Life on themillions.com. From last September, there is Ferri's "Another Side of Sylvia," which is a review of Johnny Panic and the Bible of Dreams. The review of Johnny Panic has a few inaccuracies, such as "Stone Boy With Dolphin" far pre-dates "Mothers." And it was "Stone Boy with Dolphin," not "Mothers," that could have been part of "Falcon Yard" which was the title of Plath's first novel attempt. Hughes' infidelity was discovered in the summer of 1962, not spring. I'm drawing a blank here, but do we know what the title of the novel Plath destroyed was? Was Plath being "green" and recycling the title? "Snow Blitz," "The Smiths," and "America! America!," also, were not stories written for the women's magazines, they a mixture of non-fiction writings. Plath's writing for women's magazines includes "Day of Success," and a few stories not included in Johnny Panic such as "The Perfect Place," "Shadow Girl," and "A Winter's Tale." Also, in Ferri's "In Which We Flay Ourselves Into Poets" she suggests that Plath's journals capture her frustration about not finding a publisher for The Bell Jar. Um, do you have the missing journals because that is most certainly not in the Unabridged Journals I have open next to my computer. There is one actual mention of Plath's novel in the Unabridged Journals. See the note on page 696, where Karen Kukil indicates that Plath annotated her journal entry from December 12, 1958. In the journal Plath wrote "Why don't I write a novel?" The annotation reads, "I have! August 22, 1961: THE BELL JAR". There is much "palpable" "anguish" regarding other attempts by Plath to have works published throughout the Unabridged Journals, but not in reference to The Bell Jar, which, like The Colossus, was published rather easily in Britain. Robert McCrum at The Observer, published "Ted Hughes: The Poet Who is Coming in from the Cold" on 9 May. The article appeared in the New Review section, page 45. Lorna Bradbury of The Telegraph reviews the Spoken Word Sylvia Plath CD in her review, "From the Archive: The Spoken Word: Sylvia Plath." Not perfect (Assia Wevill and Ted Hughes were not married... how many times have we been over this?) and not a complete review (its focus, like many others, is on "Two of a Kind"), but another positive opinion on the British Library publication. What I think is best about all that's been written so far is that the focus has shifted so far away from the perpetual doom & gloom opinion of Plath. The recordings show her as so lively & personable & professional. And critical, such as, in "Two of a Kind", when she turns the tables on Owen Leeming and leaves him a stumbling-bumbling mess. A true step forward. The following was sent to me by artist Kristina Zimbakova. There will be a solo exhibition of Linda Adele Goodine’s photographic and video art at the National Gallery of Macedonia, in the city of Skopje, May 11th-24th, 2010. Two series of photography - “Seneca Honey” and “Gibson Lemon” - will be on display. 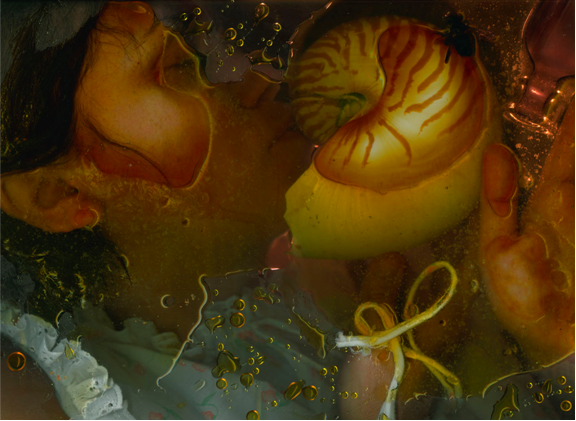 The “Seneca Honey” series and the video artwork “Bee Asana: The Healing of Plath” are both inspired by the Bee Sequence poems of Sylvia Plath. The video and part of the photographs were also presented during Sylvia Plath’s 75th Year Symposium in Oxford in Oct 2007. Literary references have always been a rich source of inspiration for Goodine’s art. Albeit known as a distinguished poet and writer, Plath was deeply influenced by visual art, and, in turn, she has influenced a generation of artists from a wide range of disciplines. Photographer Goodine created compositions by directly placing objects and herself on a digital flat bed scanner. She also created large life-size constructed sets that encompassed figures, honey, bees, and hives, in Indianapolis and on site in upstate New York, at the honey farm where her friends had grown up. The “Bee Asana: The Healing of Plath” multi-media format artwork consists of digital stills translated into a narrative sequence. Quotes from Plath’s four famous Bee Sequence poems provide a parallel textual reference that articulates the movement of the piece. Linda Adele Goodine is Professor of Photography at Herron School of Art and Design within Indiana University/Purdue University in Indianapolis, USA. The illustration at the top of this post is Goodine's "Buckwheat." Did Sylvia Plath predict the future in her 1961 poem "Insomniac"? Are riding to work in rows, as if recently brainwashed."